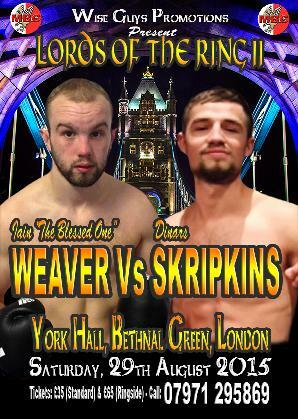 London – Monday, 24th August 2015 – Former Team GB star Iain ‘The Blessed One’ Weaver is set for his first UK bout, since returning from America, this coming Saturday at the York Hall in Bethnal Green, where he will face Latvian Dinars Skripkins. Weaver, who last fought at York Hall back in October 2013, has been establishing himself as one of the top prospects in the ultra competitive Super Featherweight division internationally. Since his last visit to the home of boxing in the Capital City, Weaver has secured two excellent first class stoppage wins over Spain based Moroccan Hassan Elyatouti and Brazilian Edilson Rio. In his last bout, against Newark, New Jersey’s then unbeaten prospect Wanzell Ellison, Weaver was the victim of some good old fashioned home cooking of the scorecards, to blot his otherwise pristine record. Now back on British soil once more Weaver, made it clear that he is determined to get a couple more good wins under his belt, before attempting to get a rematch against Ellison on neutral ground sometime next year. “To say we were disappointed last time out is an understatement, I won that fight comfortably, yet only one judge scored it my way. We’ll fight this Saturday and then have at least one more fight here, then we will be doing everything we can to secure a rematch, this time either here in the UK or maybe somewhere neutral like Germany. Back to now though, I’m really looking forward to being back York Hall, I have such fond memories of fighting there. There’s always a good atmosphere there, it really is a special place. We don’t know too much about Dinars (Skripkins), but have heard he is a very tough kid. Earlier this year he beat German prospect Tunahan Keser and from what we’ve heard that was a great fight and a fantastic performance by Dinars. Iain Weaver versus Dinars Skripkins features on the Mark Lyons and Billy James-Elliott Wise Guys promotions LORDS OF THE RING II event will take place at York Hall, Bethnal Green, London on Saturday 29th August 2015. Tickets, priced £35 (standard seated) and £65 (Ringside) are available from any of the boxers taking part, on-line at www.tkoboxoffice.com and www.wiseguypromotions.com or call 07960 850645 or 07807 282559.